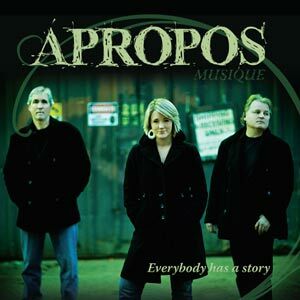 Apropos is a contemporary acoustic group comprised of three talented musicians. Curt Masterson - Grew up in a family of singers and musicians. Singing harmonies was an everyday experience. He started playing guitar at age 8 and never put it down. His father and mother were both in the TV and Radio entertainment business in Hollywood. A songwriter and lyricist, he has a special talent for connecting with a song. Laura Shayne Newbury - Gifted with a beautiful voice inherited from her father Mickey Newbury (yes, the world famous singer/songwriter). Laura has her own distinctive style and when she sings people listen. Her father Mickey Newbury has written songs covered by Elvis Presley, Stevie Wonder, Waylon Jennings, & Tammy Wynette just to name a few. Neil Henderson - From songwriting to producing, engineering to acting, Neil has the gift and the experience. Neil has won American Song Festival Awards for three consecutive years, had a #1 hit in Mexico, written a Broadway Musical and performed on stage with major artists including Richard Marx, Melissa Etheridge, Charlie Daniels, Rod Stewart and Stevie Wonder.